As a kid I was amazed by the multitude of cities and places found on maps or globes. I wondered what Madagascar looked like and what the people who lived in Novosibirsk were like. After seeing pictures of a place like Angel Falls on TV, I would go find it on a map and be intrigued that something so mammoth and enigmatic could be displayed by a tiny symbol. Maps are filled with tiny black dots, each representing a city. Those dots also represent the stories, history, and experiences of the people who live there. Thinking of the millions of stories behind each tiny black dot on a map makes the world seem like an endless wonder of culture and geography. Eventually for me, pictures and stories were not enough, and I found it was time for an adventure to one of these far-away places. I wanted to have a better understanding of how life was different in one of those little black dots on the other side of the world and needed to go there to really experience it. My curiosity led me to rural Tanzania, which seemed as far away – both physically and culturally – as I could get. With help from Global Volunteers, I was teamed up with a private school in rural Tanzania in the Village of Pommern, about two hours south of Iringa. While there, my assignment at the school entailed teaching computers and geography. In preparation, I developed some basic lesson plans and even pulled a few things out of my old Computer Science book for class. When I finally made it to the school after 17 hours worth of flying and nine hours of driving, I realized I was going to have to throw my lesson plans out the window and start from scratch. Growing up in a time and place where the computer has emerged as an indispensable tool, I didn’t expect the type of challenges I faced in Tanzania. The West is a place where electronic technology is ubiquitous. Even those who aren’t computer-savvy have been exposed to technology and used something like a telephone or a remote control. This isn’t the case with most people in Tanzania. We spent several full class periods working on the computer double-click – not the concept, the action. The mouse was something so foreign that the children didn’t know what to make of it, or how to click it. 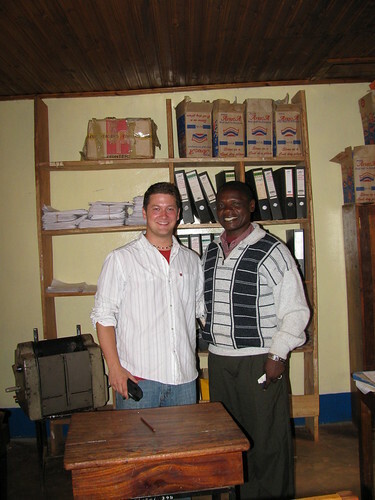 Edward, my favorite teacher (pictured with me below), reminded me that repetition was key. Thus rather than working on file management or word processing, I sat with each student and held their hand on the mouse and we double clicked for hours until they developed some muscle memory for the double-click. For the geography class, in addition to discussing topographic maps required by a national examination – yes, they even teach to the test in rural Tanzania – I wanted to discuss map distortions, a difficult but critical concept in understanding how we display a three-dimensional earth on a two-dimensional map. Trying to be as resourceful as I could, I used an old soccer ball I found, still smelling of the cow dung it had rolled through the day before on the soccer field. I used the soccer ball to help me illustrate map distortions by stretching the paper around the ball, showing how the paper itself became folded and distorted. I then highlighted these areas of distortion by rubbing pencil graphite on the folds. As I straightened out the piece of paper, I looked around the room and could tell that at least the concept was beginning to click with them. While teaching presented unexpected challenges, it made me realize that these types of challenges were exactly the experiences I was seeking to help me develop a deeper understanding of the world. Now, what appears to be just another small black dot on a world map to others has real meaning to me. Behind that black dot is a story and an experience much larger than its symbol. Each time I look at the giant world map hung on my wall at home, I get excited looking at these black dots, because I know each represents another great adventure, and this keeps me excited about traveling this wonderful world.